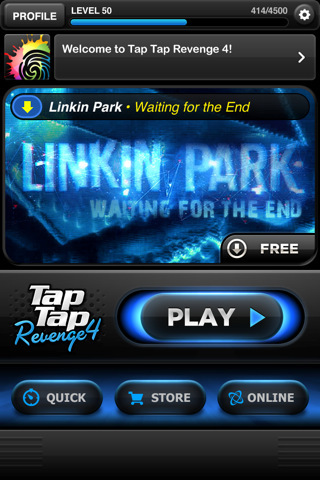 Tap Tap Revenge – a game originally based on the arcade classic Dance Dance Revolution, is back. 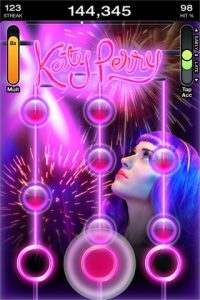 Now in its fourth incarnation for iPhone, this popular tap-to-the-rhythm game from Tapulous offers fans of the series access to over 100 free tracks, retina graphics and social features aplenty. 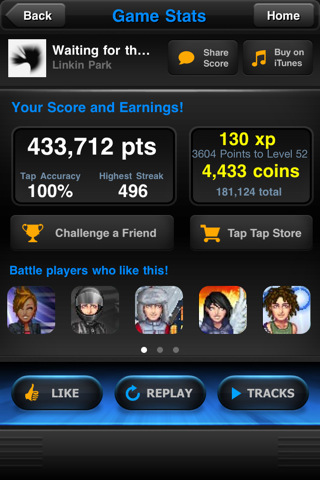 With a similar gameplay mechanic to Guitar Hero and Rock Band, but without the same level of polish, Tap Tap Revenge 4 is still a worthy alternative for the dollar-conscious considering the number of tracks included for free. Some of the songs are from popular artists, including Katy Perry, Lady Gaga and Linkin Park and many others from less well known singers and groups. The catch is that most of the popular songs are just 30 second ‘samples’, and to get full versions of most tracks requires a paid in-app download. 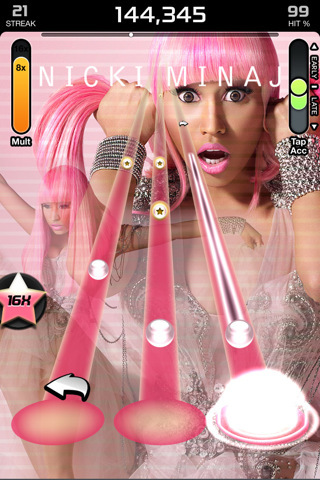 As with previous installments of the Tap Tap series, notes fall down the screen and you have to tap them to the beat of the music. There’s no change here in TTR4, and apart from an improvement in the graphics, gameplay is essentially the same. 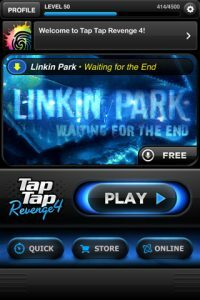 As you play your way through Tap Tap Revenge 4 you earn coins based on your performance and unlock new tracks which are added to your library. Tapulous, a recent Disney acquisition, have been touting he social features of Tap Tap Revenge 4, including Game Center integration, live leaderboards and a new avatar system – but with ‘digital clothing’ a paid upgrade, it looks more like a money-spinning gimmick than a value-adding feature. Bottom Line: A solid free download for fans of the genre – but if you’re likely to spend money on in-app track purchases I’d recommend going straight for Guitar Hero which offers a more convincing, and less commercial game.